North And West Branches of the Susquehanna River. The Frontier Forts Between The North And West Branches. Lieut. Moses Van Campen says, "Early in the month of April, 1778, he was ordered to go with his men up the North Branch of the Susquehanna river to the mouth of Fishing creek and follow up this three miles to a compact settlement, located in that region, and build a fort for the reception of the inhabitants in case of an attack from the Indians. News had come thus early of their having visited the outer line of settlements and of their committing depredations, so that terrified messengers were arriving almost daily, bringing the sad news of houses burned, victims scalped and of families carried into captivity. "It was no time to be idle; a few days, it might be a few hours, and the savage might be amongst those whom he was appointed to guard and repeat these scenes of cruelty and blood. He and his men, his command of twenty men, who, as well as himself, were familiar with the country, expert in the use of the rifle and acquainted with the Indian modes of warfare, without delay they entered vigorously upon the work, selecting a site for the fort on the farm of Mr. Wheeler (hence, when completed, it was called Fort Wheeler). It was built of stockades and sufficiently large to accommodate all the families of the neighborhood. Anticipating an early approach of the foe, they worked with a will to bring the fort to completion or at least into a condition that would afford some protection in case of an attack. The Indians, in approaching the border settlements, usually struck upon the head waters of some of the streams upon which settlers were located and followed them down through valley or mountain defile until they came near a white man's house, when they would divide so as to fall in small companies upon different habitations at the same time. "Before the fort was completed a runner came flying with the speed of the wind to announce the approach of a large party of savages. The inhabitants gathered into the fort with quick and hasty rush, taking with them what valuables they could, and leaving their cheerful homes to the undisputed sway of the enemy. Very soon the Indians came prowling around under cover of the woods and all at once, with wild yells, burst forth upon the peaceful farmhouses of the settlement. Fortunately, the inmates were not there to become victims of the tomahawk and scalping knife. From the elevated position of the fort the inhabitants could see their dwellings entered, their feather beds and blankets carried out and scattered around with frantic cries and very soon after the flame and smoke leap to the tops of their houses and, finally, the whole settle down into a quiet heap of ashes. The Indians spent most of the day in pillaging and burning houses, some of them made an attack on the fort but to little purpose. Van Campen and his men were actively engaged in preparing for a vigorous defence in case of an attack to storm their unfinished works. They were successful in surrounding the fort at a distance of four rods with a barricade "made with brush and stakes, the ends sharpened and locked into each other so that it was difficult to remove them and almost impossible for one to get through. The Indians, seeing this obstruction, were disposed to fire at them from a distance, and keep concealed behind the bushes. Their shots were promptly returned and a brisk firing was kept up all the time till evening. It was expected that the Indians would renew the attack the next morning and, as the ammunition of the fort was nearly expended, Van Campen sent two of his men to Fort Jenkins, about eight miles distant, on the Susquehanna, who returned next morning before dawn of day with a plentiful supply of powder and lead. The remaining hours of darkness were spent in running bullets and in making needed preparation for the encounter they were looking for on the approaching day. They judged from what they knew of the superior force of the enemy and from the activity already displayed that the struggle would be severe." In the morning they found the enemy had disappeared. "The Indians, not liking the preparations made to receive them, retired, leaving blood on the ground, but nothing else that would indicate their loss. But the Indians, not satisfied with this visit made another attempt to surprise this fort in the month of June. "On one evening in the month of June," says Lieut. Van Campen, "just at the time when the women and girls were milking their cows, a sentinel called my attention to a movement in the bushes not far off, which I soon discovered to be a party of Indians making their way to the cattle yard. There was no time to be lost. I immediately selected ten of my sharpshooters and, under cover of a rise of ground, crept between them and the milkers. On ascending the ridge we found ourselves within pistol shot of our lurking foes. I fired first and killed the leader; this produced an instant panic among the party, and they all flew away like a flock of birds. A volley from my men did no further execution; it only made the woods echo with the tremendous roar of their rifles; it sounded such an unexpected alarm in the ears of the honest dairy women that they were still more terribly frightened than the Indians. They started upon their feet, screamed aloud and ran with all their might, fearful lest the enemy should be upon them. In the mean time the milk pails flew in every direction and the milk was scattered to the winds. The best runner got in first." Lieut. Van Campen appears to have made Fort Wheeler his headquarters this season when not engaged in scouting. After the Sullivan campaign, in the fall of 1779, when Van Campen returned to Fort Wheeler, his father living thereleaving there late in March, 1780. Fort Wheeler, the traditions of the many descendants of the men who occupied the fort say, was not abandoned but held by hardy settlers, when not garrisoned by troops and that it is the only one of its date of the line in front of Fort Augusta that was not destroyed. Of course, I do not include McClure, Rice or Swartz, as they were built later. Near here lived Peter Meelick, who served as one of the committee of safety for this Wyoming township from its institution until super-ceded by another system. There is nothing to-day to indicate where the fort stood except the spring is there. Mr. William Creveling, who owns the property, says many years ago he ploughed up the fire place. O. B. Melick, Esq., of Bloomsburg, says the place his grandfather, the Peter Meelick above named, and his father fixed upon as the site of Fort Wheeler is the same as that shown by Mr. Creveling. Mr. Theodore McDowell, since dead, showed the same site as the one he and his comrades when boys used to visit as the remains of Fort Wheeler. The grave yard, where the soldiers and others were buried, about thirty rods from the site, I regret to say, is not cared for. There is not a dissenting voice as to the site, but a unanimity rarely found. Mr. Isaiah Wheeler, on whose land the fort was built, and whose dwelling the stockades enclosed, was a settler who came here from the State of New Jersey, and some accounts say he died and was buried here. Col. Joseph Salmon, a man of prominence as a scout and of extraordinary courage in these times, when examples of courage were not rare, married one of his daughters. It is said an open manly rivalry existed between Van Campen and Salmon for her hand, when Salmon distanced the lieutenant and won the damsel. Mr. Joseph Crawford, an old and respected citizen of Orangeville, says his father, John Crawford, was born in Fort Wheeler soon after its completion in 1778, being the second white child born in this vicinity. 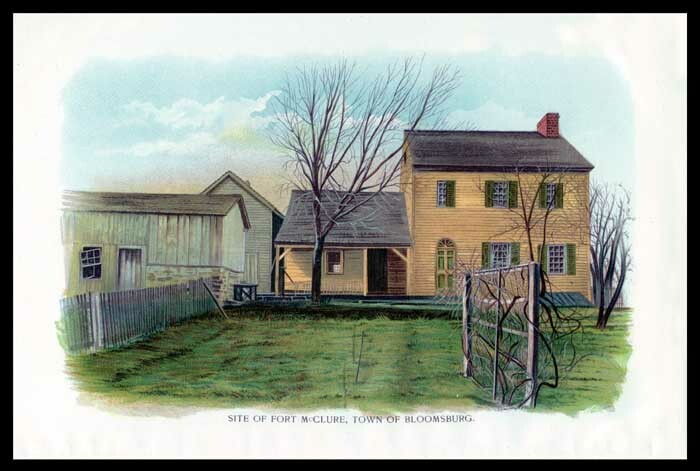 Site of Fort McClure, Town of Bloomsburg. Col. Freeze says, the year 1777 and the next four or five following, were years of great activity and danger in the Indian fighting in and about what was originally Columbia county. The regular military authorities had done their best to protect the frontiers of the Pennsylvania settlements, but they had few officers and fewer men to spare from the Federal army, and therefore, the defense of the settlements fell upon the local heroes and heroines of the Forts of the Susquehanna. A chain of forts, more or less protective had been constructed, reaching from the West Branch to the North Branch of the Susquehanna, comprising Fort Muncy, Fort Freeland, Fort Montgomery, Bosley's Mills, Fort Wheeler and Fort Jenkins. The great war path through the valley, known as the "The Fishing Creek Path," started on the flats, near Bloomsburg, on the North Branch, up Fishing creek to Orangeville, on to near Long Pond, now called Ganoga Lake, thence across to Tunkhannock creek. (Note.Col. Freeze is mistaken; the Indian with Van Campen and Pence, followed the path up the east branch of Fishing Creak, known as Huntington Creek, and in Huntington township, fired on Col. John Franklin's men, slightly wounding Capt. Ransom, as related by Moses Van Campen. J. M. B.) It was on this very path that Van Campen, the most prominent Indian fighter on the North Branch was captured, in 1780, and no man better than he knew the great necessities of the section. The destruction of Fort Jenkins in 1780 had exposed the right flank of the protecting forts and the Indian marauders made wild work among our defenseless frontiers. On his (Van Campen's) return from captivity he assisted in organizing a new force, repairing the forts dismantled or abandoned, and also stockaded the residence of Mrs. James McClure, and the place was thereafter known as McClure's Fort. It is on the north bank of the North Branch of the river Susquehanna, and is reported to have occupied the exact site of the present dwelling house of the late Douglas Hughes, below Bloomsburg, about one mile above the mouth of Fishing creek. It was an accessible point and gave the command of the military line across the river valley. It became the headquarters for stores and expeditions, and was an important point so long as it was necessary to maintain fortifications on the river. It does not seem to have ever been formally attacked, but there are traditions of lurking savages and hurried embarkings upon boats and canoes and the protection of the wide Susquehanna. How thrilling soever these adventures may have been they are now forgotten. How are they blotted from the things that be!" FORT BOSLEY, OR BOSLEY'S MILLS. Fort Bosley was situated in the forks of the Chillisquaqua, at Washingtonville, Derry township, Montour county, and was the grist mill of a Mr. Bosley, who moved here from Maryland a few years before the Revolution, bringing his slaves with him. He built the mill, it is said, in 1773; it is supposed he fortified (stockaded) the mill in 1777; upon the Indians becoming troublesome it was garrisoned by troops and recognized by the military authorities as of importance. After the fall of Fort Freeland it became more so, holding the forks of the Chillisquaque and defending the stream below it. The Chillisquaque Valley and its surroundings are among the most beautiful in the State. At Washingtonville, the main stream is formed by one considerable branch coming from the Muncy Hills, following through the rich lime stone lands to the south. The east branch here joins it, making a fine stream that then flows southwesterly to the river. This great scope of fine arable lands attracted settlers early, Bosley's Mills became a necessity, and, situated as it was, within the forks about sixty to eighty rods above the junction of the branches, on the east bank of the North Branch of these streams. It soon became widely known; roads and paths led to it as a central point, and on the Indians becoming troublesome and the mill fortified, it became a haven of refuge at which the wives and families could be placed in safety at alarms, while the husband and father scouted for intelligence of the foe or defended the fort. As Bosley's Mills do not appear to have had a heavy garrison of troops (twenty men at most) at any time, the garrison was most probably augmented by the near set tiers, of which there was quite a number. It must have been strong, as we have no account of any attack on the place, lying as it does below the great war path through or over the Muncy Hills, it must have been looked upon by the foe as strong. Lieut. Col. Weltner to Board of War, dated Northumberland, April 9, 1780, says: "I have this moment received an express from the West branch, about 12 miles from this Town that the Indians have killed and scalped one man and two children, took one woman prisoner, but she happily made her escape from them in the night. The country is very much alarmed, and likely to go to the flight as they cannot be supplied with provisions, ammunition or flints, as these commodities being so very scarce. I have manned three material outposts, viz: Fort Jenkins, Fort Montgomery and Bosley's Mills. It is out of my power to scatter my men any more, as I have scarcely as many in Town as will man 2 pieces of artillery." The site of the old mill is recognized readily by the race and mill site and is on the land of Jesse Umstead, Jr., at the lower end of the built up town of to-day. The head race has been continued on across the road and utilizes the old dam site and head race for a modern mill. Fort Rice, At Montgomery's, Northumberland County. 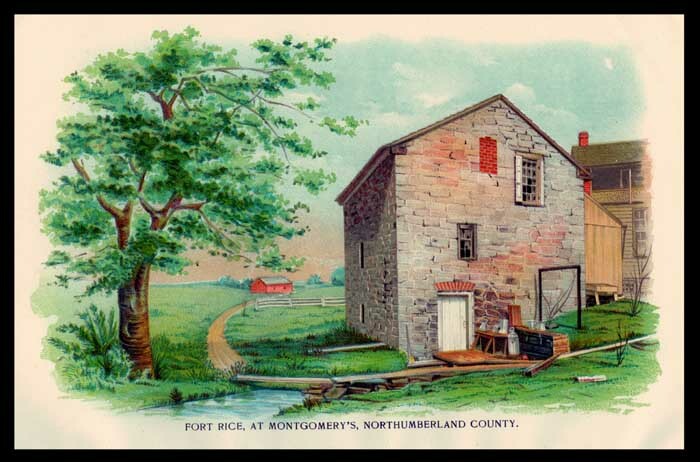 Fort Rice, at Montgomery's, sometimes written of by one name by the military and other authorities and at another by the other until it was supposed to indicate two separate forts. It is located in Lewis township, Northumberland county, Pa. Scene of the Sugarloaf Massacre, 1780. The Indians burned Mr. Montgomery's house; he took his family to Paxtang, where they remained to the close of the war. The Indians burned the house and everything; In consequence of the fall of Fort Freeland it became necessary to fill its place by another. McClung's place, which, I understand, was between Freeland and the Montgomery farm, was first selected, but it was decided to be impracticable, when, finally the Montgomery farm was selected, and here Captain Rice, of Vol. Weltner's German Regiment, erected it in the fall and winter of 1779 and 80. It was built around and enclosed the fine spring at the burned residence of John Montgomery, and remains to-day a lasting tribute to the excellency of the work of Capt. Rice's Pennsylvania Germans. First, building a stockade for security they completed it, building it out of surface limestone. They occupied and defended it ably. The only attack made on the fort itself we have any record of occurred in the beginning of September, 1780.  A letter from Col. Samuel Hunter, at Sunbury, Sept. 21, 1780, found in Vol. viii, p. 567, Penna.. Archives, saying: "We were alarmed by a large party of the enemy making their appearance in our county on the 6th inst. They came first to a small fort that Col. Weltner's troops had erected on the headwaters of the Chilisquake, called Fort Rice, about thirteen miles from Sunbury (17), when the German Regiment marched off the enemy attacked the fort about sundown and fired very smartly. The garrison returned the fire with spirit, which made them withdraw a little off, and in the night they began to set fire to a number of houses and stacks of grain which they consumed. In the meantime our militia had collected to the number of one hundred men under the command of Col. John Kelly, who marched to the relief of the Garrison, and arrived there next day. The people in the Garrison acquainted Col. Kelly that there must be two hundred and fifty or three Hundred of the Enimy, which he did not think prudent to engage without being Reinforced. The confusion this put the inhabitants in, it was not easy to collect a party equal to fight the savages. I immediately sent off an express to Col. Purdy on Juneate whom I heard was marching to the Frontiers of Cumberland County with the militia, he came as quick as possible to our assistance with one Hundred and ten of the militia and about Eighty Volunteers, which was no small Reinforcement to us. Genl. Potter Just coming home from camp at this critical time came up to Sunbury and took command of the party that went in Quest of the Enimy. But previous to his marching, discharge the Volunteers as he concluded by the information he had received from spyes we had out that the enemy did not exceed one Hundred and fifty and that they had withdrawn from the inhabitants to some Remote place. General Potter, However, marched on to Muncy Hills, but was a little Baffled by the information of their route and did not come on their track till the 13th and followed on about 50 miles up fishing creek, the road the enemy took, but finding they had got too far ahead returned here the 17th inst. The enemy got but one scalp and one prisoner (The Colonel did not know of their having committed the Sugarloaf Massacre when he wrote). We all concluded the enimy had gone off, but on the 18th there was a small party made their appearance on the West Branch about fourteen miles above this place, they killed one man and wounded another, and killed their horses they had in the plow, which plainly shows they have scattered into small parties to Harras the inhabitants, which I am afraid will prevent the people from getting crops put in the ground this fall. When the German Regiment marched off from here I give orders for the Frontiers Companys to embody and keep one-fourth of the men Constantly Reconnoitering. After garrisoning Fort Jenkins, Fort Rice, and Fort Schwartz with twenty men in each of them, this was the only method I could think of encouraging the people as we were left to our own exertions. Only about thirty of Capt. McCoys company of Volunteers from Cumberland County, until the 10th Inst., that two companies of militia came here from the same county in the whole about eighty men. When I received the intelligence of a large party of savages and tories coming against Fort Rice, I give orders to evacuate Fort Jenkins as I did not look upon it to be tenable, which is since burned by the Enimy, and would have shared the same had the men staid there on act. of the Buildings that were adjoining it, &c."
As to the numbers attacking Fort Rice, Genl. Potter (Vol. viii, p. 563), says: "Since I wrote the above I am informed by Capt. Robeson that a large body of the enemy crossed the Moncey Hills near one Evses and went up the Moncey Creek so that it is leekly (likely) that the number that was down amounted to 300 menthey carried off a large number of Cattle and Horses." John Montgomery returned with his family on the return of peace. Finding the buildings of his farm destroyed and a good strong stone house supplying its place; he at once occupied the fort, which, with additions, made him a comfortable home for years. Capt. Rice leaving the country, Montgomery remained and it soon became known as Montgomery's fort. The old actors in the bloody drama enacted in this region having passed away, Fort Rice was forgotten except as found in the old records, which placed it thirteen miles from Sunbury and on the head waters of the Chillisquaqueboth erroneous. Fort Rice was lost as to site to the present generation. After considerable research I became satisfied Fort Rice and Montgomery must mean the same place. Hon. John Blair Linn, of Bellefonte, at this time sent me a newspaper cutting, recording an examination of the subject by J. F. Wolfinger, of Milton, in about 1885 (since dead). I have found his statement correct in the main and here present it: "Our ancestors and first settlers on the West and North branches of the Susquehanna River had two great runaway times from the Indians. The first took place in 1778 and the second one in 1779. * * * * John F. Montgomery must certainly have known how and why this stone building was built over his spring, but as he died in November, 1792, and left no writings with any person to show that the German Battalion had built it and had a fort and barracks standing close by his spring (falling into the error that there was a Fort Rice and a Fort Montgomery close together, he mistook the defences erected to protect the soldiers and their arms and commissary while building Fort Rice for the Fort Montgomery which Rice is). The knowledge of these facts was entirely unknown to the coming generations of people in this beautiful region of country called Paradise, and, hence, a great many different stories very naturally arose as to when the old stone building in question was built and by whom it was built and why it had small port holes in its walls and the like. July 13, 1885. On this day I visited this old Fort Montgomery or Rice ground, accompanied by my old friend, the Hon. David B. Montgomery, a grandson of the above John F. Montgomery, and who, I mean David B. M. has for many years resided about a hundred and fifty yards south of the spot. Spring House BuildingsA Grand relic. This building is 20x 23 feet outside measurement and is two stories (and an Attic of 4 feet) high, being 22 feet high from the ground up to its square on the west side and on a part of its northern end, it is now used as, and forms in its lower story a splendid spring house for keeping milk, cream, butter, meats and the like in a very nice and cool condition and it afforded me a good deal of pleasure to have a drink from its clear, cool and refreshing waters. "The walls of the fort are two feet thick and are composed of rather small dull colored limestone, as no quarries were open at that early day to get stones of a large size and of a clear strong blue color. But its walls are still solid and in a very good condition, considering their age and the hasty manner in which Capt. Rice's German soldiers made them. The door to the spring was and still is in the south end of the building and it had when built in 1779 a wooden stairway that extended from the ground on its eastern side up to the second story, where there was another door for the purpose of storing away there for safe keeping such things as Capt. Rice and his men needed for their use and comfort. But this stairway is gone long ago and the doorway on the second story was also changed long ago into a window, but on the east side it had and still has two windows with twelve panes of glass in each window and all the windows were of the old-fashioned sort, 7-1/2x8-1/2 inches in size, but one or two of these smaller sized windows have been walled shut with bricks. The northern end of the second story (third story or attic) still has two small port holes made there, no doubt, to enable soldiers standing there to stick their guns through the holes and fire at any Indians that might come there with an evil design, but it is probable that every other side of the building had smaller port holes for this same purpose, but they are all gone now excepting the two just noticed. Mr. Henry Raup, who lives in a fine two-story brick house on the east side of the spring house, called my attention to the fact that a smooth-faced stone in the central part of the southern end wall and about eighty feet above the ground, contained on its face the letters W. B. that were so thinly cut into the stone as to make them after so long a time now have but a faint appearance. As W. and B. are the initials of Capt. William Rice, I now found the evidence strong enough to satisfy me that Fort Rice, Montgomery, you can call it now by either of those names just as you please, actually stood here and nowhere else, on the west side of the road that runs in front of Raup's house up north to and beyond Turbotville. Some time after John F. Montgomery had returned from his runaway from the Indians, he built a stone addition to the northern end of the above described spring house (fort) building, an addition large enough to make a fine eating room for his family and work hand, and then to make things handy for the women he cut a hole through the wall of the fort and put a door there to go into the spring house for milk, butter, &c. This additional room was torn away long ago and the above doorway was walled up again but a portion of the plastering of this room still sticks to the northern wall of the old fort. Capt. Rice's old building aforesaid thus forms a grand and very interesting relic of our olden time building that every man in the county should be proud of and feel a great pleasure in visiting." I visited the place in 1894 with James I. Higbee, of Watsontown, and Mr. Yarrington, of the same place and secured a picture of probably the best preserved fort of its date in the State. I found it two stories and in attic of four feet or more at the square of the building, could recognize the old port holes in the walls of the second story. The old-fashioned chimney was in the northern end, the spring covered about half the space inside the walls of the lower story. We hung "Old Glory" out of one of the old port holes, I suppose the first time since the close of the Revolution. Capt. Rice's name was Frederick William Rice. Site of Fort Freeland, Showing Spring And Old Kitchen. The sad history of this death trap is well and widely known, on Warrior run, about four miles east of Watsontown and one mile east of well-known Warrior Run church; it was stockaded in the fall of 1778 by Jacob Freeland and his neighbors, enclosing a large two-story log house of Jacob Freeland, as many of the descendants of the early settlers still live in this region and the bloody ending of the place has kept it well in remembrance. Jacob Freeland here built a mill in 1773 and 1774, having brought the iron from New Jersey. Mr. Enoch Everitt, of Watsontown, now owns the fine farms on which it was located. A depression on the yard to the large brick farm house marks the cellar to the site of the old Freeland house. A fine spring of water near the house is still used by the farm house of today. In Vol. xii, Penna. Archives, p. 364, is found the recollections of Mary V. Derickson, born in the Fort Freeland, written in 1855, seventy-five years after the occurrence, but is remarkably clear. John Blair Linn, in his Annals of Buffalo Valley, and John F. Meginness, in his "Otzinachson," give us full particulars, drawn largely from the Archives. 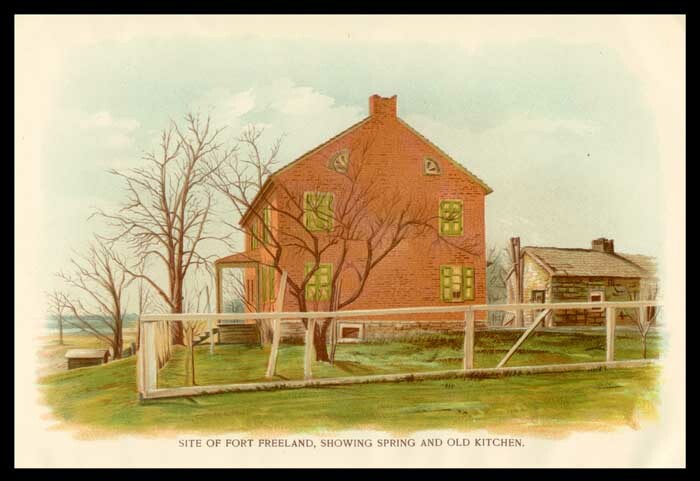 Mary V. Derickson writes: "Sir: In compliance with your request, I will give (so far as my memory will serve) all the account of the early settlers and occupants of Fort Freeland. The fort was situated on the Warrior run creek, about 4-1/2 miles above where it empties into the Susquehanna river. In the year 1772, Jacob Freeland, Samuel Gould, Peter Vincent, John Vincent and his son. Cornelius Vincent, and Timothy Williams, with their respective families cut their way through and settled within some two miles of where the fort was afterwards built. They were from Essex county, New Jersey. Jacob Freeland brought the irons for a grist mill, and in the years 1773 and 1774 built one on Warrior Run. There were several more families moved up from the same place, and they lived on friendly terms with the Indians until 77, when they began to be troublesome and to remove their own families, in the summer of 78, they had to leave the country, and when they returned in the fall they picketed (stockaded) around a large two-story log house (which had been built by Jacob Freeland for his family), enclosing half an acre of ground; the limbers were set close and were about twelve feet high; the gate was fastened by bars inside. Into this fort, or house, the families of Jacob Freeland. Sen., and Jacob Freeland, Jr., John Little, Michael Freeland. John Vincent, Peter Vincent, George Pack, Cornelius Vincent, Moses Kirk, James Durham, Samuel Gould, Isaac Vincent and David Vincent, all gathered and lived there that winter. In November George Pack, son of George Pack, was born, and on the 20th May, George, son of Isaac Vincent, was born, on the 10th of February, 1779, I was born. My father was Cornelius Vincent. In the spring of 79, the men planted corn but were occasionally surprised with the Indians, but nothing serious occurred until the 21st day of July, as some of them were at work in the corn field back of the fort, they were attacked by a party of Indians,, about nine o clock, A. M. and Isaac Vincent, Elias Freeland and Jacob Freeland, Jr., were killed and Benjamin Vincent and Michael Freeland were taken prisoners. Daniel Vincent was chased by them but he outran them and escaped by leaping a high log fence. When the Indians surprised them, Ben. Vincent (then ten years of age) hid in a furrow, but he thought he would be more secure by climbing a tree, as there was a woods near, but they saw him and took him a prisoner. He was ignorant of the fate of the others until about two o clock P. M., when an Indian thrust a bloody scalp in his face and he knew it was his (and my) brother's Isaac's scalp. Nothing again occurred until the morning of the 29th about daybreak, as Jacob Freeland, Sen., was agoing out the gate he was shot and fell inside of the gate. The fort was surrounded by about three hundred British and Indians, commanded by Capt. McDonald. There were but 21 men in the fort and but little ammunition. Mary Kirk and Phoebe Vincent, commenced immediately and run all their spoons and plates into bullets; about nine o'clock there was a flag of truce raised, and John Little and John Vincent went out, to capitulate, but could not agree. They had half an hour given to consult with those inside; at length they agreed that all who were able to bear arms should go as prisoners, and the old men and women and children set free, and the fort given up to plunder. They all left the fort by 12 o'clock P. M. Not one of them having eaten a bite that day and not a child was heard cry or ask for bread that day. They reached Northumberland, eighteen miles distant, that night and there drew their rations, the first they had that day. When Mrs. Kirk heard the terms on which they were set free she put female clothes on her son William, a lad of 16, and he escaped with the women. Mrs. Elizabeth Vincent was a cripple; she could not walk. Her husband John Vincent, went to Capt. McDonald and told him of her situation, and said if he had a horse that the Indians had taken from his son Peter the week before that she could ride about daylight next morning. The horse came to them; he had carried his wife to the lower end of the meadow, where they lay and saw the fort burned, and it rained so hard that night that she laid mid side in the water; when the horse came he stripped the bark off a hickory tree and plaited a halter, set his wife on and led it to Northumberland, where there were wagons pressed to take them on down country. After the surrender of the fort Capts. Boone and Daugherty arrived, with thirty men; supposing the fort still holding out they made a dash across Warrior run, when they were surrounded. Capt. Hawkins Boone and Capt. Samuel Daugherty, with nearly half the force were killed; the remainder broke through their enemies and escaped. Thirteen scalps of this party were brought into the fort in a handkerchief. Soon after this the fort was set fire to and burned down. The killed of the garrison and Boone's party, from best information, to be arrived at amounted to about twenty men, but two such men as Boone and Daugherty in such times were of more value to such a community than many common men. Thus ended Fort Freeland. Robert Covenhoven, the famous scout and Indian killer of the West Branch, had passed down ahead of this party of Tories and savages, giving notice of their approach, but it is said Fort Freeland did not get notice. Ammunition was hard to get, almost impossible sometimes to procure, which may account for Fort Freeland being so short that the women had to run up their spoon and "pewter" plates, but one would suppose, if there was any head to the garrison after the attack of a few days before, when their loss was three killed and two captured, he would have caused them to be better prepared for another attack. Each succeeding generation on the Warrior run since the fall of Fort Freeland has pursued up the site of the place that no doubts exist in regard to it. The effect of the fall of Fort Freeland was disastrous to this region, accompanied as it was with the death of Boone, Daugherty and their brave comrades, and the desertion of Boone's Mills as a post of defence. It entirely uncovered Fort Augusta to the inroads of the enemy, Bosley's Mills alone, with its small garrison standing on the defensive on one flank liable to be overthrown when any considerable force of the enemy appeared before it. Colonel Hunter, holding his base with a force so feeble as to warrant a less courageous commander in calling in every man and gun for the protection of Augusta, as comparatively few persons remained to protect in his front, but holding what he had left. In November the German Battalion was sent him, counting about one hundred and twenty men, with which he secured his base, built Fort Rice and garrisoned it, and built Fort Swartz and also garrisoned it, as well as Fort Jenkins with thirty men,with ten to fifteen militia at Bosley's Mills, and a few of the inhabitants to hold Wheeler, eighty to ninety men in all, besides his garrison of Augusta. At this date his left flank had been contracted from now Lock Haven to Milton, with his right weak but intact. Affairs did not improve much in this department to the close of the war in 1780. The right flanking fort was destroyed by the troops being withdrawn in an emergency, and some time elapsed before the flank was again protected by Fort McClure, at now Bloomsburg. Boone's Fort was erected on Muddy run, a short distance from the West Branch of the Susquehanna, on the east bank. It was a grist mill stockaded and owned by Capt. Hawkins Boone (a cousin to the famous Daniel Boone), and, according to Linn's Annals of Buffalo Valley, came originally from Exeter, Berks county. Soon after the consolidation of the 12th regiment, Pennsylvania Line, into the 3d and 6th, Capt. Boone, Capt. Brady and Capt. Daugherty were mustered out of service and sent, at the urgent request of the people of the West Branch to lead their defence. Boone stockaded his mill and was assisted by his neighbors and troops in defending it. A large, hardy, brave, generous man, he appears to have been highly respected by those knowing him. His fall at Fort Freeland, in 1779, was a serious loss to the community, who looked to good results from his ability and experience; a confidence that was abruptly terminated by his bloody, but soldierly death, attempting to rescue his fellow man. Probably his loss was more of a public calamity than any man in the valley except his comrade in arms, Capt. John Brady. In rebuilding the Kemmerer (Boone) mill, the men employed dug down to the old foundations of the Boone mills, showing the present mills occupying the same site. It is about midway between Milton and Watsontown. The Pennsylvania Archives, Linn's Annals and Meginness Otzinachson all show his ability and courage and the loss to the community by his death, as well as his assistant, Capt. Daugherty. After Boone's death his fortifications are not heard of. Fort Swartz was built on the east bank of the West Branch, at the old Ferry, about a mile above Milton, a log structure, named in honor of Lieut. Christian Godfried Swartz, of Col. Weltner's German Battalion, who stockaded and defended it. It was built after the destruction of the forts above it on the river. It covered the river and its small garrison did some scouting duty. It was one of the three forts left standing from the North Branch to the West in the spring of 1780, viz: Wheeler, Rice and Swartz. It does not appear to have ever been attacked but was a sturdy little sentinel to challenge and give notice of anything passing down the river towards Northumberland and Sunbury. After the German Battalion left, it was garrisoned by the militia, when defended by any other than citizens. (In the History of the Forts, Penna. Archives, vol. xii, Appendix, p. 461, is "All we find about this fort is in a letter from Genl. Potter, dated Sunbury, September 18, 1780, in which he says I discharged the Volunteers that came from Cumberland and as soon as we could get provisions, which was the next morning, I marched the remainder, consisting of 170 men, upon the West branch to Fort Swarts. I then went to Col. Kelly, who lay at the mouth of White Deer creek with 80 men." On the 21st of September he again writes: "I gave orders to the frontier companys to embody and keep one-fourth of the men, constantly reconnoitering, after garrisoning Fort Jenkins, Fort Rice and Fort Swarts, with 20 men in each of them.") Day says Fort Swartz was one mile above Milton. Meginness says at the ferry, about one mile above Milton, a log structure garrisoned by and named for Major Christian Godfried Swartz, of Col. Weltner's regiment. "One of the saddest incidents of these troublesome times was the assassination of Capt. John Brady by a concealed foe on the 11th of April, 1779. He was living with his family at his fort, as it was termed, at Muncy, and was taking an active part against the Indians. On this fatal day he made a trip up the river to Wallis' for the purpose of procuring supplies. He took a wagon and guard with him, and, after securing a quantity of provisions started to return in the afternoon. He was riding a fine mare and was some distance in the rear of the wagon. Peter Smith, the same unfortunate man who lost his family in the bloody massacre of the 10th of June, and on whose farm young James Brady was mortally wounded and scalped by the Indians on the 8th of August, was walking by his side. When within a short distance of his home, Brady suggested to Smith the propriety of his taking a different route from the one the wagon had gone, as it was shorter. They traveled together until they came to a small stream of water (Wolf run), where the other road came in. Brady observed: This would be a good place for Indians to hide; Smith replied in the affirmative, when three rifles cracked and Brady fell from his horse dead. As his frightened mare was about to run past Smith he caught her by the bridle and, springing on her back, was carried to Brady's Fort in a few minutes. The report of the rifles was plainly heard at the fort and caused great alarm. Several persons rushed out, Mrs. Brady among them, and, seeing Smith coming at full speed, anxiously enquired where Capt. Brady was. It is related that Smith, in a high state of excitement, replied: "In Heaven or hell, or on his way to Tioga," meaning he was either killed or a prisoner by the Indians. The Indians in their haste did not scalp him, nor plunder him of his gold watch, some money and his commission, which he carried in a green bag suspended from his neck. His body was brought to the fort and soon after interred in the Muncy burying ground, some four miles from the fort (now Hall's station, P. & E. R. B.) over Muncy creek." His grave is suitably marked at Hall's, while a cenotaph in the present Muncy cemetery of thirty feet high, raised by J. M. M. Gernerd by dollar subscription, attests the lively interest still felt by the community in one who devoted himself to the protection of the valley when brave active men and good counselors were needed. Of his sons, Capt. Samuel Brady, a sharpshooter of Parr's and Morgan's rifles, fought on almost every battlefield of the Revolution, from Boston and Saratoga to Germantown, can speak of his deeds as a scout and Indian fighter Western and Northern Pennsylvania, which West Virginia and Ohio attest. To the Indian he became a terror, and he fully avenged the blood of his sire shed at Wolf run, on the West Branch of the Susquehanna, that beautiful day in April, 1779, at the bloody fight of Brady's Bend, on the Allegheny, where, with his own hand, he slew his father's murderer and avenged his brother James, the "Young Captain of the Susquehanna," in a hundred other fights. Of his second son, James, killed by the Indians at the Loyal Sock, whose career bid fair to be as brilliant as his elder brother's but unfortunately cut off at his commencement. John, who, when but a boy of fifteen, going with his father and oldest brother to the battlefield of the Brandywine to bring back the horses, finding a battle on hand, took a rifle and stepped into the ranks and did manful duty, and was wounded. He is said to have served with Jackson at New Orleans in the War of 1812. William Perry Brady served on the northern borders in the same war, and at Perry's victory at Lake Erie, when volunteers were called, was the first to step out. Hon. John Blair Linn, at the dedication of the Brady monument in 1879, one hundred years after the death of John Brady, said: "To the valley his loss was well, nigh irreparable; death came to its defender, and Hell followed hard after. 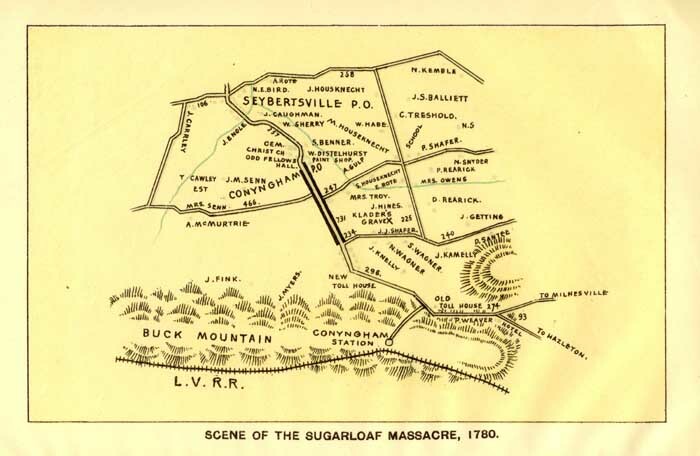 In May, Buffalo Valley was overrun and the people left, on the 8th of July Smith's mills, at the mouth of the White Deer Creek were burned, and on the 17th Muncy valley was swept with the besom of destruction. Starrett's mills and all the principal houses in Muncy township burned, with Fort Muncy, Brady and Freeland, and Sunbury became the frontier." And, in speaking of the fall of Capt. Evan Rice Brady at South Mountain, in the war of 62, said: "Four generations of the Bradys fought for this country, yet he was the first to fall in action." The site of Fort Brady adjoins the town of Muncy, on the south side of and near the built up portions of the town on lot owned by Mrs. Hayes. Until late years, a flag staff has stood, marking the site. Mr. J. M. M. Gernerd, the well-known antiquarian of Muncy, keeps a good lookout for the site. No question as to its genuineness.